Why Choose B-right's Panel Light? * Upgraded Material: Die-cast aviation aluminum , great heat dissipation; Intelligent constant current driver, good surge protection, fireproof, safe and durable. * Uniform Soft Light Effects: Sideways emit light, through the light diffuser and guiding plate create uniform and soft light effect, that is pleasant on the eyes with flicker-free. * Convenient Install: Assembled the spring clips, remove your troubles to install the clips than other brands. What's more, each panel lamp we added 2 Wiring Caps to easily wire them to 110v power cable. * 2-Year Free Warranty: We working hard to listen to what the customers demand and making sure that everyone enjoys shopping at B-right. Any questions, you can feel free to contact us, we will provide 100% satisfications to you. Are they UL listed? And be safe to contact insulation? - In order to help our customers to control the product cost, thus control the price, we don't apply for UL listed currently, but it's not means that our products has risk to use it, most of customers like this product, we have basic safety certifications, like CE, RoHS and FCC which comply with the basic certification requirements; Constant current led driver; Low voltage output and low heat design, made of insulation material, no fire hazard. 1. According to the max load capacity of the dimmer to install appropriate quantity in one dimmer switch. 2. 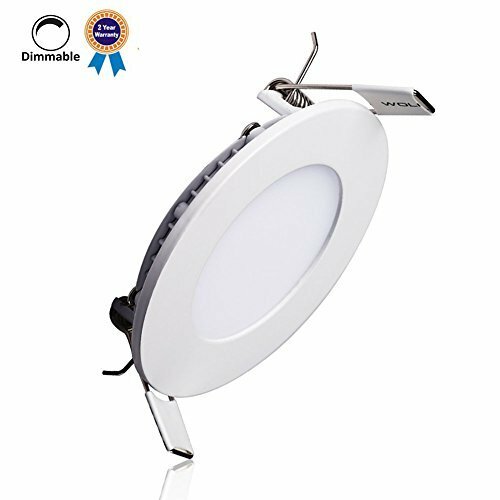 Recommended to increase the number of 10-20% of product to meet the product illumination, if the installation height over 8ft. What You Care: 8" cut hole size, ultra-thin approximately 1" thickness; Very little heat generated; No recessed can needed; Junction box not included, transformer size about 1 1/2 inches x 3 1/2 inches. One light come with one transformer. Energy Efficiency: 1400 lumens, 140 watt halogen replacement uses only 18 watt. Base on 5 hrs/day, estimate yearly energy cost $3.6, and it will lasts about 16.5 years. How to Install: Turn off the power-Cut a appropriate hole on sheetrock-Connect the driver to the 110V power supply-Pull up the sprinng clips and put the panel hook on the hole-Adjust the panel to stick the ceiling tightly. Extension Cable Provided: 5FT, 10FT, 20FT Extension Cable to extend the distance between light fixture and led driver, if you want, you can search "B-right extension cables" on Amazon, buy now for your convenient installation.